Unique and very cute! 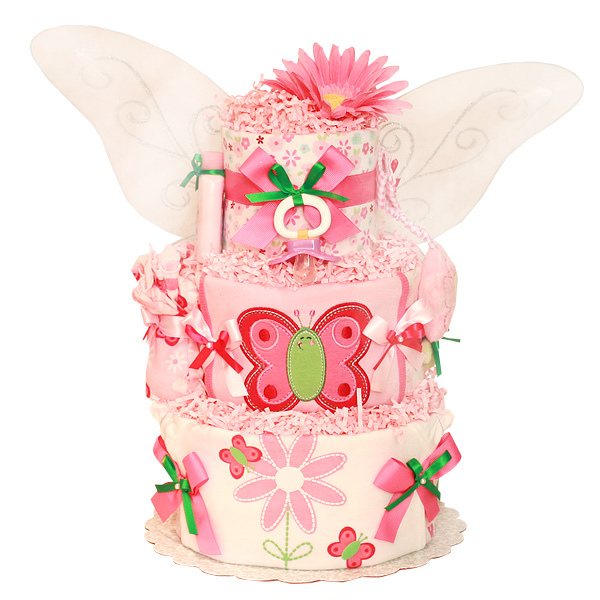 Fly Little Butterfly Diaper Cake is a great baby shower gift and a gorgeous centerpiece for a Butterfly themed baby shower. Can also be used to welcome a new little baby girl in the hospital room. This diaper cake is made of 40-50 Pampers Swaddlers diapers size 1 (8-14 lbs. ); three flannel receiving blankets 100% cotton; one pacifier; one bib with a butterfly; one bodysuit; one pair of pants; one flower toy; one JOHNSON'S Baby Lotion (With that unmistakable baby fresh scent) 1 fl oz; one pair of white butterfly wings; silk flower; ribbons and bows.